In this issue: a zombie plague, tourist town magic, and a classic reborn. All that, plus a new contest! With human civilization annihilated by a biological zombie plague, a rag-tag fleet of yachts and freighters known as Wolf Squadron scours the Atlantic. Every ship and town holds the flickering hope of survivors. Now Wolf Squadron must take on another massive challenge: clear the assault carrier USS Iwo Jima of infected. 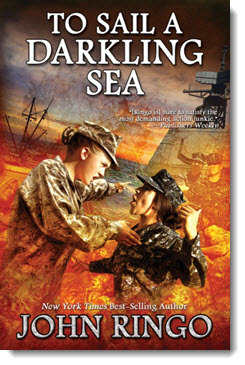 For civilization begins as the boats of the Wolf Squadron become a beacon of hope on a darkling sea. Sequel to Under a Graveyard Sky. These are exciting times in Archers Beach, Maine. An unprecedented early season has united townies and carnies in an effort to recapture the town's former glory. Kate Archer, owner-operator of the vintage wooden carousel, is caught up in the excitement. But the town's new energy isn't the only change afoot. A local drug lord, whose previous magical consultant was vanquished by Kate, has acquired a new ally—and this one plays with fire. Sequel to Carousel Tides. 1632, the book that plunged the modern town of Grantville, West Virginia into 17th century Europe and launched one of the best-selling alternate history series of all time, is now available in hardcover for the first time. This stunning leatherbound edition of Eric Flint’s groundbreaking novel includes the original mass market cover art. A must for fans, both new and old, of the Grantville saga. 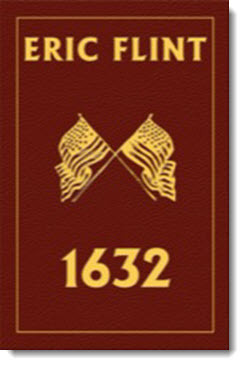 Add the 1632 Leatherbound Edition to your collection today! Spend this Valentine's Day (and the rest of the month, too!) 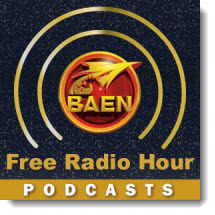 curled up with your favorite Baen authors on The Baen Free Radio Hour. In-depth interviews with the authors you love, about the books you hold dear. Where Were You in 1632? 1632. A very special year for fans of Eric Flint's Ring of Fire series. We’d love to hear your story of discovering Eric Flint’s 1632 and the Ring of Fire series for the first time. Email us a short reminiscence (250 words or less) on how you discovered the series, when you first knew it was something special, and how it changed your reading life for the better. Winner receives a special free signed leatherbound hardcover edition of 1632! Even if you’ve just discovered the Ring of Fire series, send your entry along. Beginner’s luck applies! The High King of the Human kingdoms of Alanda is not doing his job. Now Nightingale and her friends must face off with a powerful church and its plot to make non-human sentients into second class citizens—and perhaps eliminate them entirely. The dragon, breathing fire and darkening the sky with its huge batlike wings, fearsome yet fascinating, touches something deep in the human soul. Tales of the fabulous reptiles by Mike Resnick, Diane Duane, Jodi Lynn Nye, S.M. Stirling, William R. Forstchen and more. 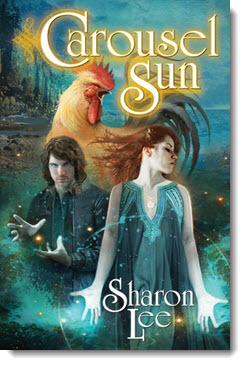 Don't forget to check out the newest ebook releases here, plus Baen.com free fiction from Sharon Lee here. 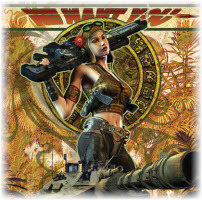 Also, don’t miss the monthly free non-fiction, article, “From Smart Flesh to Custom Organs” here, and part four of a series by Tom Kratman, “Training for War,” here.